Now that we are in the month of March, for most of us in the northern hemisphere the worst of the winter is over, and it is only a few days until 21 March, the first day of spring. There is a commonly held view that March 21 is the spring equinox and that the equinoxes are the two days in the year when all places on the Earth have exactly 12 hours of daylight and 12 hours of darkness. In fact, as I’ll explain later, this is only approximately correct. March 21 can sometimes be the date on which the spring equinox falls but the precise date varies from year to year and also depends upon where you are located. In fact, at the equinoxes there is actually nowhere on the Earth where there are exactly 12 hours of daylight and 12 hours of darkness. 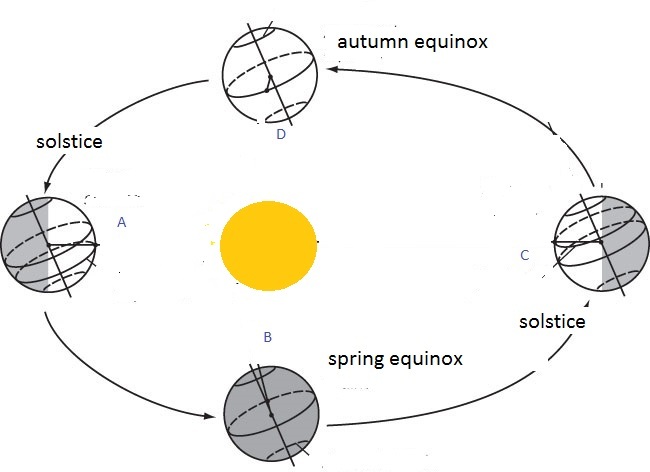 The origin of the word equinox comes from two Latin words aequus (equal) and nox (night), suggesting that at an equinox the length of the day and night are equal. However the precise astronomical definition of an equinox is slightly different. Because the axis of the Earth is tilted rather than perpendicular to its orbit around the Sun, different parts of the Earth are closer to the Sun at different times of the year. At the winter solstice in December (point A in the diagram) the North Pole is tilted furthest away from the Sun than at any other time of the year, and the South Pole is tilted nearest the Sun. In the northern hemisphere the period of darkness are longest compared with the period of daylight, and in the southern hemisphere the reverse applies. At the summer solstice in June (point C in the diagram) it is exactly the opposite of the winter solstice – it is the North Pole which is now tilted nearest to the Sun so the northern hemisphere experiences the longest period of daylight. There are two times a year (B and D in the diagram) when the neither the North Pole nor the South Pole are tilted towards the Sun and these times are the equinoxes. At any given latitude, whether north or south of the equator, there will be the same amount of daylight. On what date do the equinoxes occur? The diagram also shows that the Earth moves in an oval, or elliptical, orbit around the Sun. This means that it has further to travel in its orbit between the March equinox and the September equinox than in the return leg of its journey from September to March. The two equinoxes are therefore not exactly half a year apart: from the March equinox to the September equinox is around 186 days, whereas from the September equinox to the March equinox is only 179 days. The tables below give the times of the two equinoxes from 2016 to 2021 for three Locations: London (Greenwich Mean Time or GMT), Honolulu (GMT -10 hours) and Tokyo (GMT +9 hours). As you can see, the northern hemisphere spring equinox can occur on March 19, 20 or 21 and the autumn equinox on Sept 22 or 23. Over a longer time span there is an even greater range of dates (see notes). What date of the year are there are exactly 12 hours of daylight? The first point to consider is what to we mean by daylight? Do we consider twilight, the time just after sunrise or just before sunset when it is not completely dark, to be daylight? If we use the common definition of “hours of daylight”as being the interval between sunrise and sunset then there are actually slightly more than 12 hours of daylight at the equinox everywhere in the world. There are two reasons for this. First the definition of sunrise is actually the point at which the first light from the Sun’s rays reaches above the horizon,not when the centre of the Sun is above the horizon. 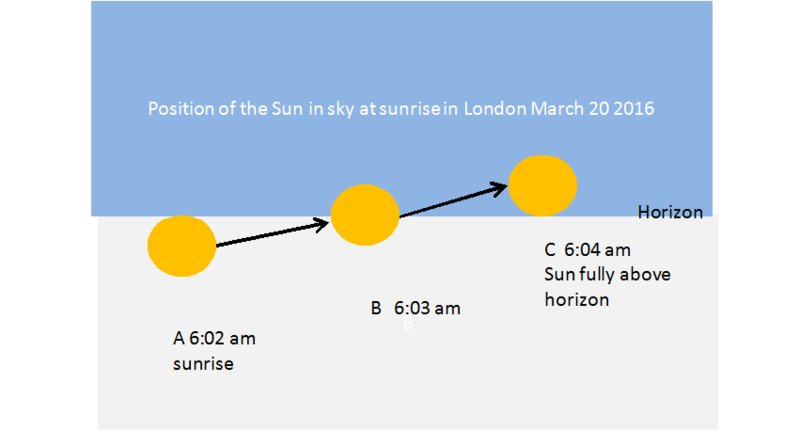 The diagram below shows the path of the Sun’s disk at sunrise at the equinox in London. 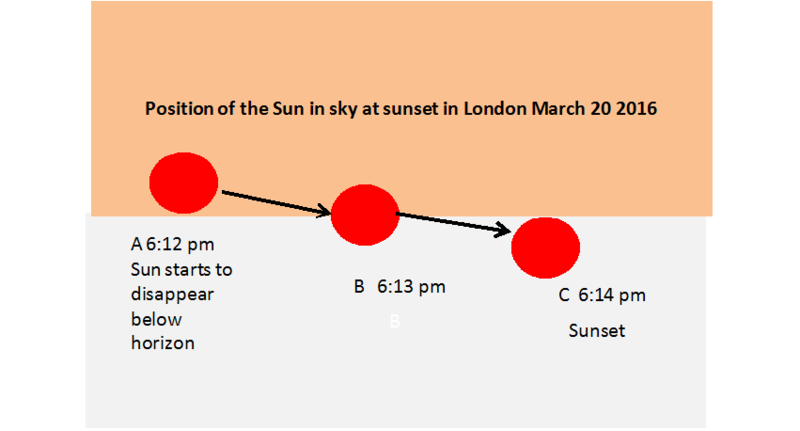 Similarly, at sunset the time when the half of the Sun is above the horizon and half below the horizon is 6:13 pm, shown as B in the diagram, but sunset is defined when the very last light from the Sun’s rays are above the horizon and is about a minute after this time. In addition, when the Sun is just below the horizon, the Earth’s atmosphere bends the Sun’s rays, causing it to appear just above the horizon. This bending of light is known as refraction and has the effect of slightly extending the hours of daylight. Taken together, these two effects mean that there are slightly more than 12 hours of daylight at the equinox. 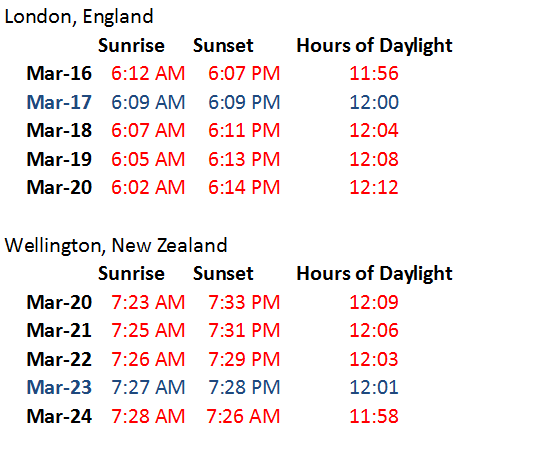 The table below shows the dates around the equinox in London and Wellington (in the northern and southern hemispheres respectively) and it is clear to see that date on which there are exactly 12 hours of daylight and 12 hours of darkness is not 20 March. 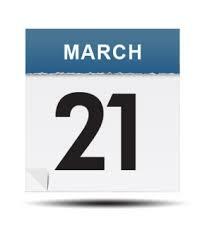 In London it is 3 days earlier on March 17 but in Wellington it is 3 days later on March 23. (2) The exact day on which there is 12 hours of daylight will vary with latitude. TimeandDate.com (2016) Solstices & Equinoxes for London (Surrounding 10 Years). Available at: http://www.timeanddate.com/calendar/seasons.html?n=136 (Accessed: 5 March 2016). TimeandDate.com (2016) London, ENG, United Kingdom — Sunrise, Sunset, and Daylength, March 2016, Available at: http://www.timeanddate.com/sun/uk/london(Accessed: 1 March 2016). For everyone in the US this year, the worst of winter has only just begun. We had spring and summer weather in January and February, and now we’re getting snow. I’m really going to enjoy your wonderful website. Thanks so much for all the effort you clearly put in.